Learning to recognize numbers and how they go into a tens frame is so much more fun when you can move around the room, and that's where scoot games come in. Students scoot from one card to the next, figuring out what the number is and filling in their tens frame or counting the objects on the card and writing the number on their recording sheet. 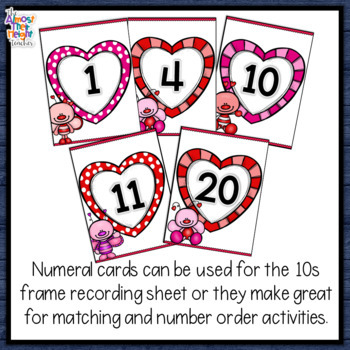 This set gives you two different Valentine themed number activities for numbers 1-20 (easily differentiated to just use numbers 1-10). Set one has numbers 1-20 written on the cards and two recording sheets (with differentiated options). Place cards around the room. 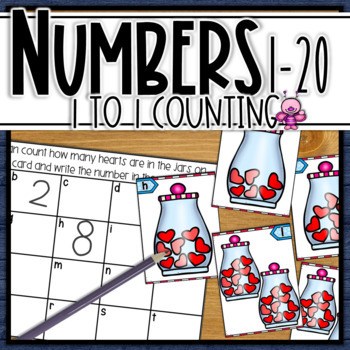 Students scoot from card to the next filling in the number on their worksheet and coloring the tens frame to show the number. 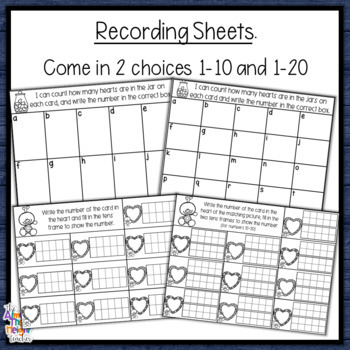 Set two has cards with Jars of Hearts (1-20) and two corresponding recording sheets. 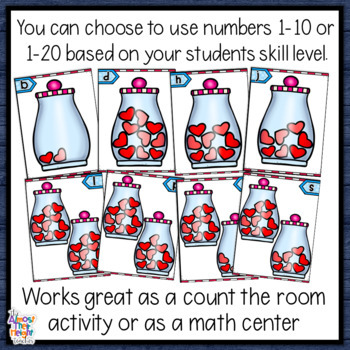 Place cards around the room (I recommend keeping them at a level students can reach so they can one-to-one count if needed), students go from card to card counting the valentine hearts in the jar and recording on the number on the worksheet. Note: there are is a variation in the tens frame in the recording sheet to aid the level your students maybe working at. In set one, you have numbers 1-10 and 11-20, and an additional 11-20 which has the first 10 on the 10’s frame filled in. Once you have had a chance to look over this resource and/or use it with your class, come back to your My Purchase page where you will see the request to leave feedback. Click on this and it will take you straight to the feedback box where you can provide a star rating and leave a feedback comment about your thoughts on the product. Each time you leave feedback, TPT gives you credit towards your future purchases. For me, I totally appreciate all the feedback I receive, it helps me with any future product directions and styles, so thank you in advance for taking the time to leave feedback. Look for the green star by my store logo and click on it to become a follower and you will receive new product updates.